document layout | Imagine Creative Communications Inc.
Forestry Stewardship Council (FSC). You may have seen their checkmark-tree logo on the back of a brochure or envelope. FSC certified paper is divided into three broad categories: 100% – virgin fibre from properly managed forests; MIX containing virgin and recycled wood fibre; and RECYCLED – made from 100% pre- and post-consumer recycled paper. In the printing industry, individual shops can also be FSC Chain of Custody certified as well using certified paper. 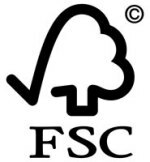 They follow a rigorous set of procedures and ensure only FSC paper is used when the FSC logo is displayed on their work. Sustainable Forestry Initiative (SFI). Another similar program originally developed by the American Forestry and Paper Association. There has been debate about whether it is a environmentally effective as FSC, since there are parts of the program that are not as rigorous as FSC. Proponents say the end result is equivalent. You won’t see the SFI logo as often on paper, as the FSC program has gained dominance in the paper industry. Some clients regularly specify that print projects use FSC paper as a sign of their social responsibility. The caveat is that FSC paper usually carries a premium with it. Not only is the paper more costly but the print shop must set up a number of additional procedures and processes, which add to the cost. Not all print shops are FSC certified, even if they use FSC certified paper. If they are not certified, they cannot put the FSC label on your project. But I had an interesting conversation with one of our printers on this topic. “The goal shouldn’t be FSC or SFI certification, but the use of 100% post-consumer recycled paper,” was his comment. Makes perfect sense! This product bypasses both FSC and SFI. Both are initiatives of the forestry industry and post-consumer recycled paper does not involve forestry at all. So, why not use 100% post-consumer paper all the time? I have to get a bit geeky for a minute. Paper is made from wood fibres. In virgin paper (0% recycled content), the wood fibres are relatively long, giving the paper strength and the ability to be folded without cracking. Each time paper is recycled, those fibres get shorter and shorter. When you have 100% post-consumer paper, the fibres are short, resulting in a paper that cannot fold without cracking. This is particularly challenging with digital printing, the direction the print industry is going. But don’t give up, people smarter than me are working on that problem. It may not be long that we can spec 100% post-consumer recycled paper with ease and confidence that the end product will look good. Later I will discuss forest-free paper products.